The R-PLEX Human MPO Antibody Set includes a matched capture and detection antibody pair and calibrator for the quick and easy measurement of MPO in biological samples. R-PLEX products leverage MSD’s electrochemiluminescence technology for better sensitivity and a larger dynamic range than traditional ELISAs. R-PLEX matched antibody sets enable the development of singleplex and multiplex immunoassays. Individual assays may be developed using MSD avidin- or streptavidin-coated plates. Custom multiplex assays with any combination of R-PLEX analytes, as well as R-PLEX and U-PLEX analytes, can be developed on U-PLEX MULTI-SPOT plates. To learn more about the advantages of R-PLEX products click here. 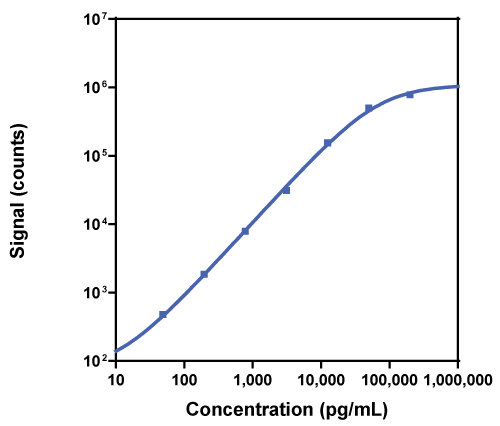 Calibration curve for the R-PLEX Human MPO Antibody Set was assessed and representative data is presented below. Description - Myeloperoxidase (MPO) is produced by neutrophils and monocytes in response to leukocyte activation. These phagocytic cells undergo respiratory burst on stimulation. The extra oxygen that is consumed during this process is converted to hydrogen peroxide. MPO reacts with hydrogen peroxide to form oxidizing complexes. The oxidants have potent bactericidal and viricidal activities. MPO has also been implicated in many pathogenic states, including multiple sclerosis and Parkinson’s disease. Resuscitation of Traumatic Hemorrhagic Shock Patients With Hypertonic Saline - Without Dextran - Inhibits Neutrophil and Endothelial Cell Activation.